When it comes to shopping for interior panel doors, there are a huge variety of ways to stylize them and tie into the flow of a home. Doors and Windows West has partnered with the top manufacturers of interior doors to supply customers with a wide variety of interior door options in order to meet the varying needs of customers. From a tight budget to complete customization, Doors and Windows West can provide you with a quote on quality interior panel doors that accentuate style in any home. Let’s take a look at exactly what a panel door is. 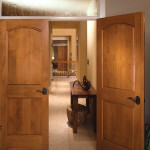 These are the wood doors most commonly found in a home. Typically interior panel doors number about 10 per home. Panel doors not only serve as room dividers and allow for privacy, but also provide a level of soundproofing. Material types panel doors are made of also differ. Medium Density Fiberboard is an engineered type of wood, specifically designed for environments where solid wood is not a viable option due to budget, climate, or finish preferences. MDF panel doors will not warp, contract and expand in hot temperatures and humidity. While MDF doors don’t have the beautiful wood grain solid wood doors have, they are often a popular choice because they can be painted to match virtually any home décor. Who doesn’t love the remarkable natural patterns of wood grain?! 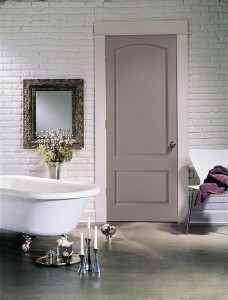 Interior panel doors are available in a wide variety of hard and soft woods. Some popular choices include: cherry, pine, oak, mahogany and maple, to name a few. Doors and Windows West discourages the use of solid wood in bathrooms and other areas that may be exposed to moisture or extreme heat as natural wood will expand and contract with its environment. This is the most basic of panel doors and the least expensive because the inside of the door is hollow. The drawback is this allows for more sound to permeate the door. Temperature also flows more freely between rooms as the door does not provide as much insulation as some other alternative interior door options. Just as the name implies, the guts of this door are solid unlike its hollow core counterpart. Like the hollow core doors, its shell is typically constructed of plywood or molded composite material, however the core of the door is constructed of a blend of wood fibers. Solid core doors provide a higher level of soundproofing than hollow core doors.